For sale a two owner British sports car with low miles. This car is a magnificent example of a late model MG with original paint and interior. 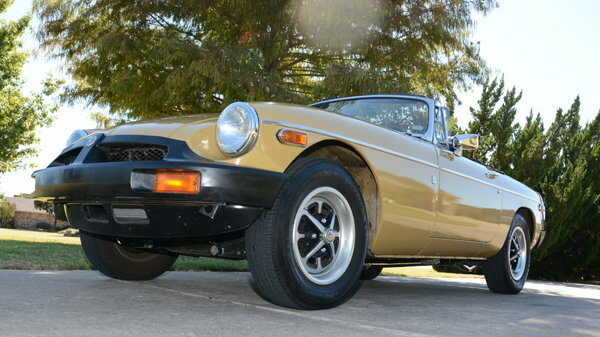 This MG is the closest you will ever come to driving a brand new MGB out of the showroom. I found it in Phoenix, AZ with only 3950 miles. It sat in a collector’s showroom for most of its life. I believe it only was driven for part of the first year and then put in the collection. Arizona is the best climate for a car as far as rust and corrosion. The only bad thing the car was not regularly driven or serviced. After buying the car I went through the entire vehicle replacing dried out plastic and rubber parts. Also the car was brought up to the European specification with dual SUs and a respectable exhaust system. It is well sorted out and runs like a new car. It also has electric overdrive which is worth its weight in gold if you are going to do any touring. The car comes with the British Motor Heritage Certificate. It was built in late 1975 and shipped October 14, 1975 to a dealer in California. Subsequently sold new in Phoenix to the person I purchased the car from. After bringing the car up to highway standards, I drove it sparingly for the last two years. It has been shown in a number of MG cars shows, wining first place several times. The car has moved up to the Premier class at the Texas MG Register. The car now has a little over 10,000 and is ready for the next owner. It’s a great car but I am ready for my next project. For more information please call Gary at 972-636-5505. No texts or emails please. Car is located in the Dallas, Texas area.